Own your beautiful mess in this "God Blessed Mess" Cherished Girl® T-Shirt in Hot Pink. Sometimes it's tough to keep it all together, and your home, car, life — may be a bit chaotic. Behind closed doors, most of us have more messes than we'd like to admit, even to our friends. The awesome thing about God's grace is, it extends to all of us. Ephesians 2:8 says, "For it is by grace you have been saved, through faith—and this is not from yourselves, it is the gift of God." He doesn't expect us to have it all together, that's what we need Him for! When we humble ourselves before the Lord, He is patient with us, and faithful to reassure us He loves us dearly — even in the midst of our imperfection. Share this hope-filled message with your fellow beautiful messes — the women you live, work, and socialize with. They need to know Jesus loves them exactly as they are. God Blessed This Mess T-Shirt, 3XLarge was published by Kerusso in January 2019 and is our 47815th best seller. The ISBN for God Blessed This Mess T-Shirt, 3XLarge is 612978477595. 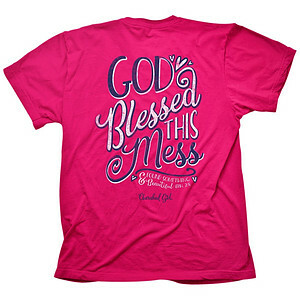 Be the first to review God Blessed This Mess T-Shirt, 3XLarge! Got a question? No problem! Just click here to ask us about God Blessed This Mess T-Shirt, 3XLarge.